USBFlashCopy is a simple solution for the backup of your flash drives and storage cards on the fly. It quietly runs in the background safely copying files from inserted media to a secure location on your hard drive. 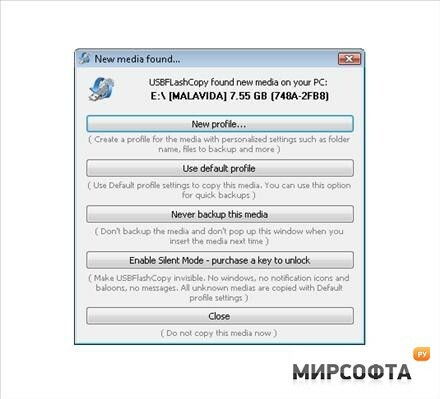 There is nothing to install and USBFlashCopy is really small taking no more than 300KB of space, it doesn't require additional libraries, frameworks or anything else to download and install. You can run it from any folder or drive. Once you have it ready to go, USBFlashCopy will automatically detect when you insert any media and then copy its content to a safe location and creates a sub-folder by default for each removable media. It fully supports profiles and includes separate settings for different flash sticks or storage cards. 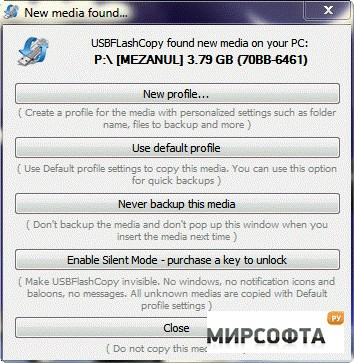 For experienced users, USBFlashCopy can run completely invisible but this feature requires purchasing a key.